Just got back from a trip with the family to Las Vegas. We had an opportunity to stay at the ever so chic Cosmopolitan Hotel, on the Vegas Strip. This was our first time being able to stay at this trendy hotel, so I was really looking forward to the experience, and see if the hype lived up to its expectations. The Cosmopolitan Hotel is located next to the Bellagio Hotel, and man, did we have an awesome view of the water show. Anyways, I am not here to be some travel guide, I am here to discuss pizza. Before arriving in Vegas, I never checked out The Cosmopolitan website to see what food choices they offered. Most hotels have a food court of some kind, many of which house at least a pizza place. After checking in, I couldn't believe it, but The Cosmopolitan didn't list any pizza places outside of the D.O.C.G restaurant, which made a Neapolitan style pie. We will be reviewing this pizza in a few days. It wasn't until a few days later that I learned from one of the girls on the Public Relations team that the Cosmopolitan housed a secret pizza joint. Yes, a hidden pizzeria located down a hallway with no markings or signs to lead you to it. This was like a dream come true for me. 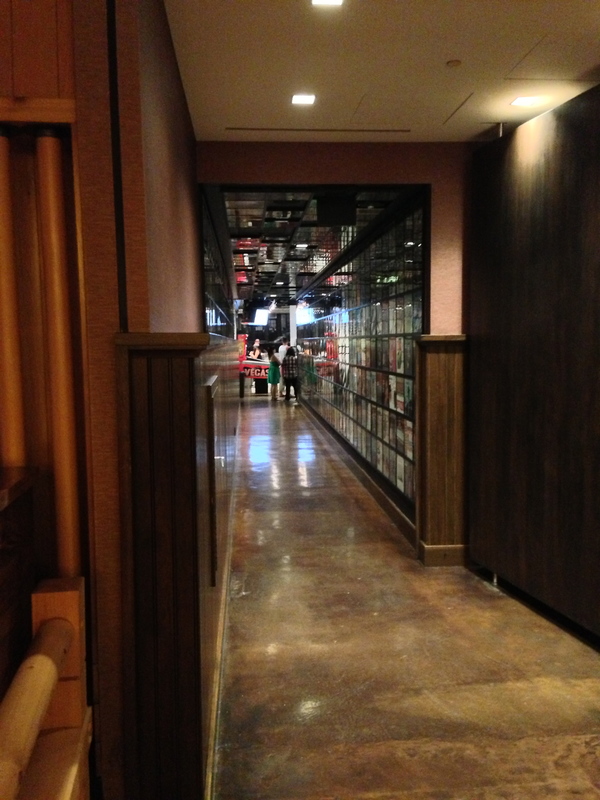 I began my search to find the secret hallway which was located in between the glass elevator and sushi place. Alas I found the vinyl album cover wallpapered hallway which lead to a couple of pinball machines and then this mirage (sorry about plugging the other hotel Cosmopolitan folks) of a pizzeria tucked into the left corner of this mysterious hallway. I couldn't believe my eyes. There, in this ultra trendy, high end hotel, sat a pizza joint. 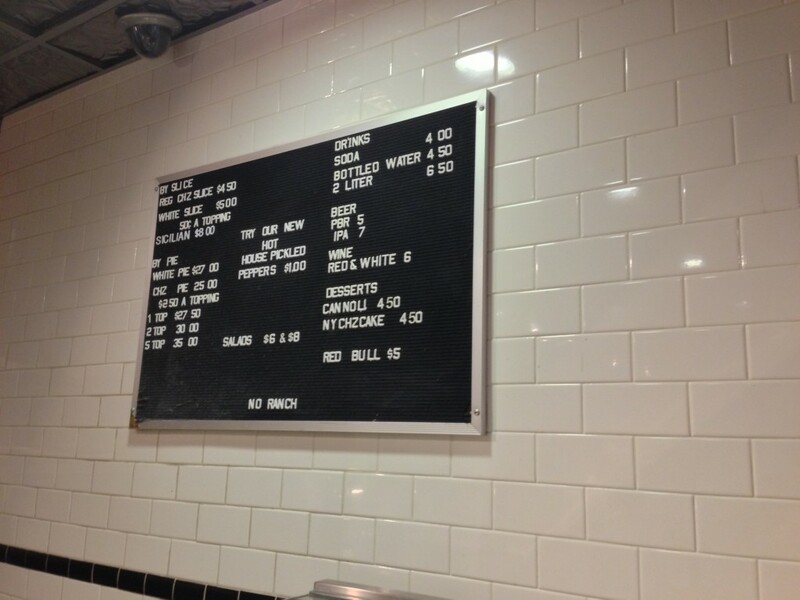 Nothing fancy, just a good old fashioned pizza counter with some ovens. It even had Jersey Shore looking guys in line waiting to eat. Now that is authentic. 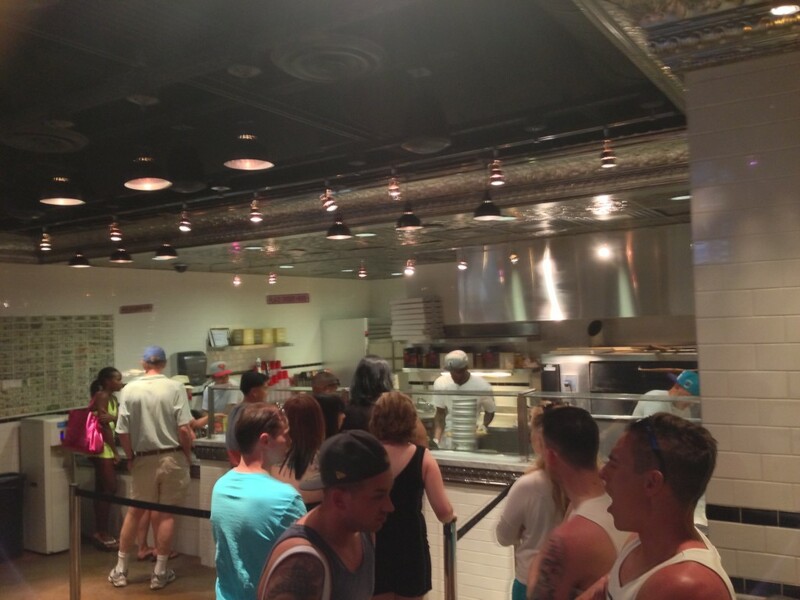 This secret pizza at the Cosmopolitan Hotel wasn't so secretive after all. This was evident by the wait to enjoy some of this alluring pizza. After a few minutes I approached the counter and ordered a $4.50 regular slice from the tattooed pizza maker behind the counter. 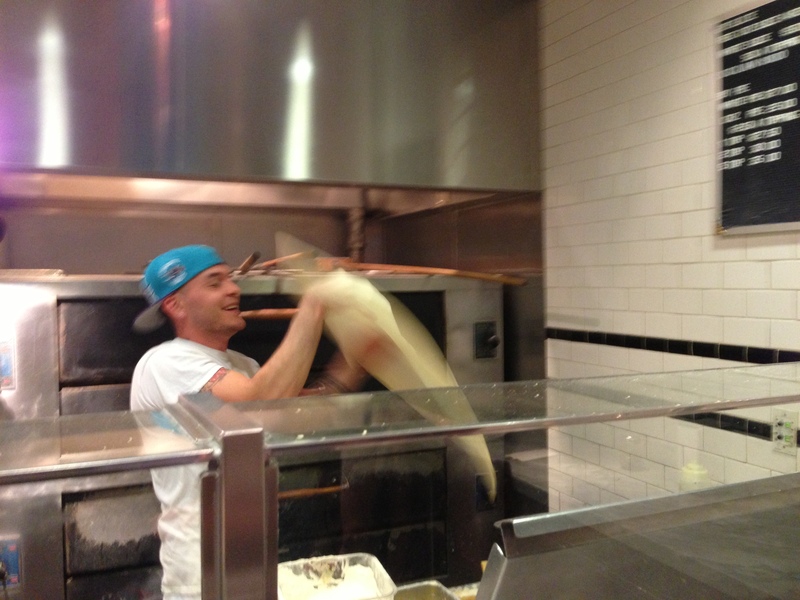 He saw me taking a photo and actually started to flip pizzas in the air to ensure I got a decent photo. What a nice tattooed up pizza guy he turned out to be. 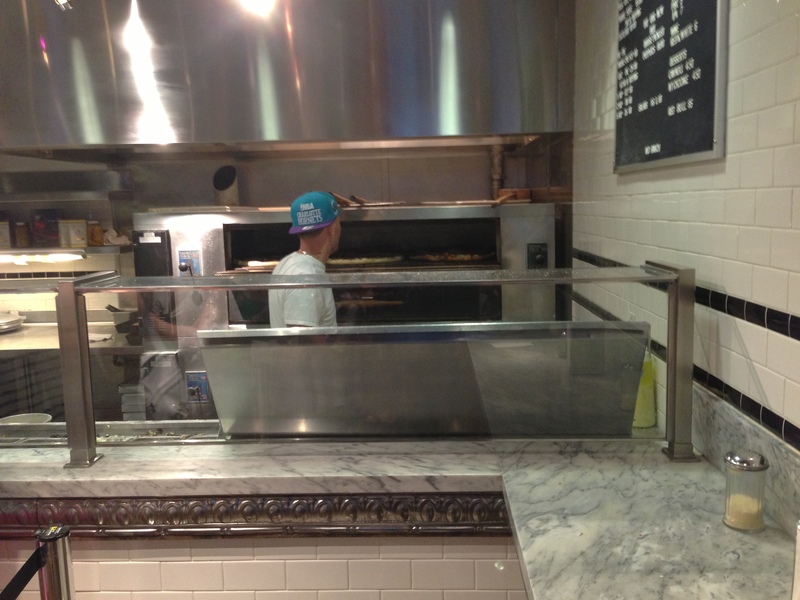 Watching him make pizza made me certain he was from New York, but it turns out he was from Vegas. This guy is a rarity. Any pizzeria would be blessed to have a guy like this behind the counter. My slice came out and was sizzling hot. It was a decent size slice and I couldn't wait to try it out. I ordered a coke with no ice, and was informed they have free refills here so although the prices are somewhat high, you still won't leave thirsty. I lifted the hot slice off the checkered wax paper and couldn't believe how crisp this slice was. It wouldn't even droop if I tried to shake it. I LOVED this. 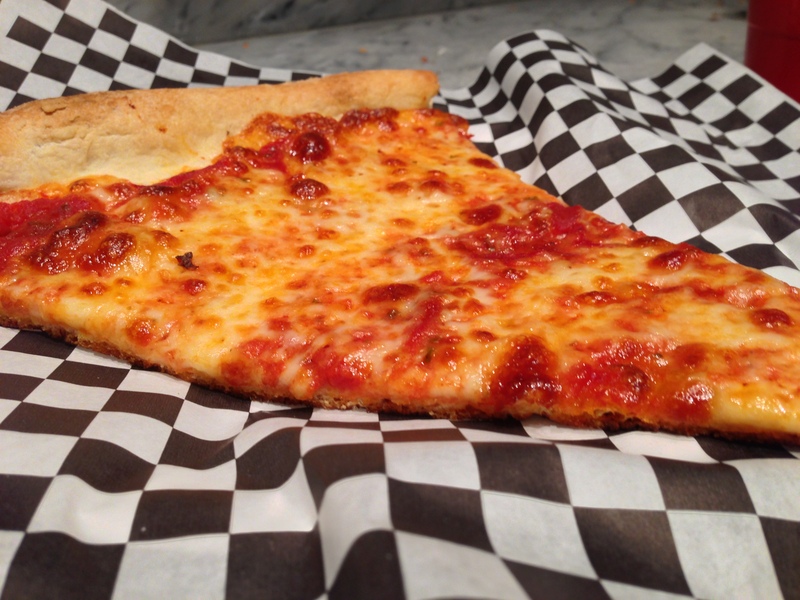 After taking my first bite, it became obvious to me that this Secret Pizza place inside the Cosmopolitan Hotel in Las Vegas, was the best pizza slice on the Vegas strip. I know, how can I say that until I have tried all the others? Well I have tried enough to know what pizza constitutes being great, and this pizza slice was in fact, great. The cheese was delicious and applied on top of a sweet tasting sauce which was home cooked to perfection. It possessed the perfect amount of spice and sweetness at the same time, and mixed with the quality mozzarella cheese, it had a fruitful aftertaste. While writing this, I can still taste it in my head. The crust as mentioned before was super crisp and had a taste that compares to some of the better slices I have had. Seriously, those who say New York Pizza is better because of the water, should try the slices they make here. 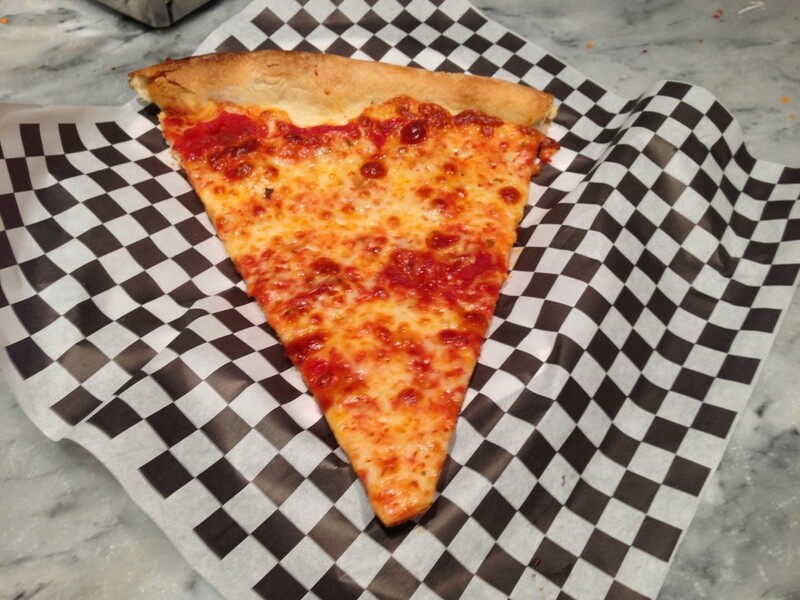 The Secret Pizza Place in the Cosmopolitan Hotel in Las Vegas gets 7 out of 8 slices.